WAIT! There’s More! I May Have Had A PB After All!! According to this article, the Around The Bay Road Race was 100 metres too long! At the pace I was going, that’s an extra 30 seconds of running. Meaning, instead of being about 15 seconds slower than my Personal Best (PB), I may have been 15 seconds FASTER than my PB!!!!!! Though it’s not official, and really changes nothing on the surface of things, in my heart, I feel I’ve just won a very signifcant victory. All those days of running in -30C and colder. All those hills I ran. Each day my alarm went off at 5 a.m., far before daybreak. All the speed drills. The long runs. The perseverance. It’s all been worth it. I feel vindicated. I feel validated. I feel A M A Z I N G ! ! ! So, the race director changes the course at the last second, nullifying the course certification, doesn’t want to bother getting it re certified (and doesn’t want to cover the expense) making EVERYONE’S results unofficial and invalid, and he doesn’t see it as a “big deal” and the only the age groupers who were trying for PR’s are complaining about it???? Seriously???? Race director needs to be fired. Something happened like this at the Twin Cities 10 miler last year…the course was very short. They certified the course, but put the turn at the wrong intersection on race day. Race director issued a statement and apology that same day. All kidding aside, you are not the first of my friends to voice outrage at not only the decision of the race director but also the director’s glibness. Even one of my friends who is not a runner but who understands how hard we work refers to him as a “jerk”. I have heard that there is a new race director in place for next year. I’ll see if that’s true. If it is true then I do wonder what the reasons are for the change in power. But you may have already taken an educated guess. How much did you have to pay to run in the race? Ohh yeah… Congratulations. Thank you Bill! How’s your back? Its getting better today is the first day I’ve been able to walk upright for more then 10 feet. I’ve nearly evolved to the Homo erectus stage. That sounds like a PB/PR to me. Congrats! A similar thing happened at a half here last year. Due to construction, they had to change the course, but the 5k was seen as the important distance so that course wasn’t modified to make up for the longer half. As a result, I set a PB/PR in the half on a course that was .2 miles too long. Clearly I still have room to improve, but it was very frustrating passing the 13 mile mark and not seeing the finish. I appreciate your nod of approval. That would’ve been really frustrating! Congrats on setting your own PB/PR even with the extra 0.2 miles! But ya, the knowledge that your time could have been even better must sting somewhat. I know it would for me. Definitely a PB. Nicely done. Thanks Paul! Getting the nod for a PB from my fellow runners is especially meaningful. I knew it! Rod 2015 is totally the winner! Can I say “I told you so”? Can I, can I, can I please? 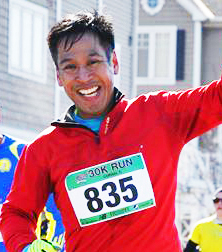 ← Me, Bernard, And Meb: A Tale Of Three Runners. Only Two Of Whom Are Actually Any Good.